Back at CES, Alphacool was showing off its Eiswand (Ice Wall) 360, an external all-in-one CPU cooling solution for cases that don't have room for an internal radiator. If you've been waiting for something like this, good news—it's now available to purchase. The concept of a liquid cooling tower sitting on the outside of a PC isn't new. I owned a Zalman Reserator back in the day with a similar overall design. The neat neat thing about these types of CPU coolers is that any heat buildup coming from the radiator is already out of the case. On the flipside, these things take up space and make moving a system a tedious task. As for the Eiswand 360, it sports quick-release connectors to make it easier to add additional cooling components to the loop, such as the Eiswolf, the company's pre-filled graphics card cooler. 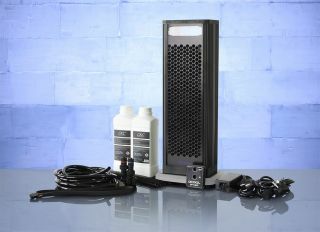 The external cooler is a 360mm full-copper illuminated radiator that measures 397 x 124 x 45 mm (LxWxH). Half a dozen fans keep the thing cool, while a pair of DC-LT pumps push the coolant. According to Alphacool, the pumps work so well that even if one fails, there won't be a noticeable loss in cooling. The Alphacool Eiswand 360 is available now direct from Alphacool for €345.95. It's also available to shipping to the U.S. from ModMyMods for $367.50.